Edward C. Stone is the project scientist for the Voyager mission. He served as the director of Jet Propulsion Laboratory, a division of NASA, from 1991 to 2001. The near-Earth space was considered to be empty until the explorations in the 1950s as a ground work for the greatest achievement, perhaps, of mankind – landing on the Moon. A remarkable discovery of the existence of solar wind occurred during this time. Solar wind is the Sun’s outer atmosphere called corona, extending all the way to the Earth and beyond. It consists of high energy electrons, protons, traces of ionized helium and heavy elements along with magnetized plasma. It is blowing out continuosly at a speed in the range 450 – 700 km/s. But how far does it go? What happens when it reaches the end of solar system? The answer is Voyager, a NASA mission. The journey to interstellar space began fifty years ago with a discovery and a prediction. Launched during the International Geophysical Year, Explorers 1 and 3 revealed that belts of energetic protons and electrons trapped in the geomagnetic field encircle the Earth. Soon to be named the Van Allen belts, they were the first major discovery of the Space Age that had begun only months earlier with the launch of Sputnik 1 by the Soviet Union. This was in 1957. During this time, Eugene N. Parker predicted that the solar atmosphere was expanding outward at supersonic speeds, filling interplanetary space with a dilute plasma of protons and other electrically charged ionized atoms of solar matter. Four years later during the first foray to another planet, Mariner 2 confirmed Parker’s prediction of a solar wind continuously streaming radially away from the Sun at more than a million kilometers per hour. Although its density is much lower than the best laboratory vacuum, the solar wind is strong enough to create the heliosphere, a giant bubble around the Sun that envelops the planets. Outside the bubble lies interstellar space filled with matter from the explosions of nearby supernovae. 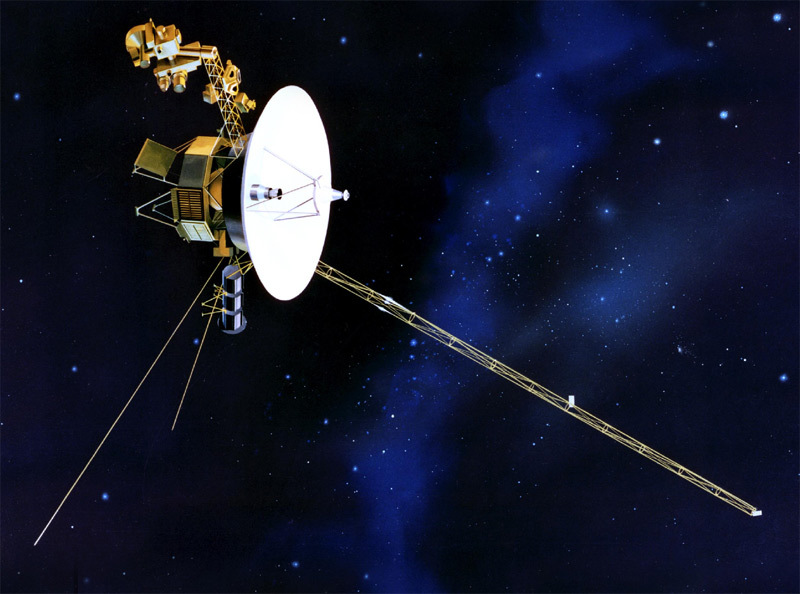 Launched in 1977 the twin spacecraft Voyager 1 and Voyager 2 will be the first human-made object to reach the interstellar space, estimated to be in the year 2015, according to the present knowledge. The motion of the heliosphere relative to the local interstellar medium creates a wind that distorts the heliosphere into a long-tailed, comet-like shape. In front, a curved interstellar bow shock resembles the bow wave of a ship. Although there are no images of the heliosphere, there are Hubble images of bow shocks in front of astrospheres around other stars. Fortunately, the two Voyagers are headed toward the nose region of the heliosphere where the distance to interstellar space is shortest. The Heliosphere. The solar wind creates a bubble around the Sun, enveloping the planets. A bow shock forms as the interstellar wind from the left is deflected around the heliosphere, resulting in the formation of a comet-like heliospheric tail. Image credit: NASA/Walt Feimer. The interaction of the Sun with the interstellar wind is complex. Models show the supersonic solar wind expanding outward until it is balanced by the pressure of the local interstellar matter outside. Near the edge of the heliospheric bubble, a termination shock (HTS) marks where the supersonic wind abruptly slows to subsonic speeds, forming a thick layer called the heliosheath. In this outermost layer of the heliosphere, the subsonic wind is deflected toward the tail of the heliosphere. The outer boundary of the heliosheath is the heliopause, where the solar wind finally makes contact with interstellar matter that lies beyond. The two Voyager spacecraft are entering the interstellar space after having crossed the termination shock and exploring the heliosheath. 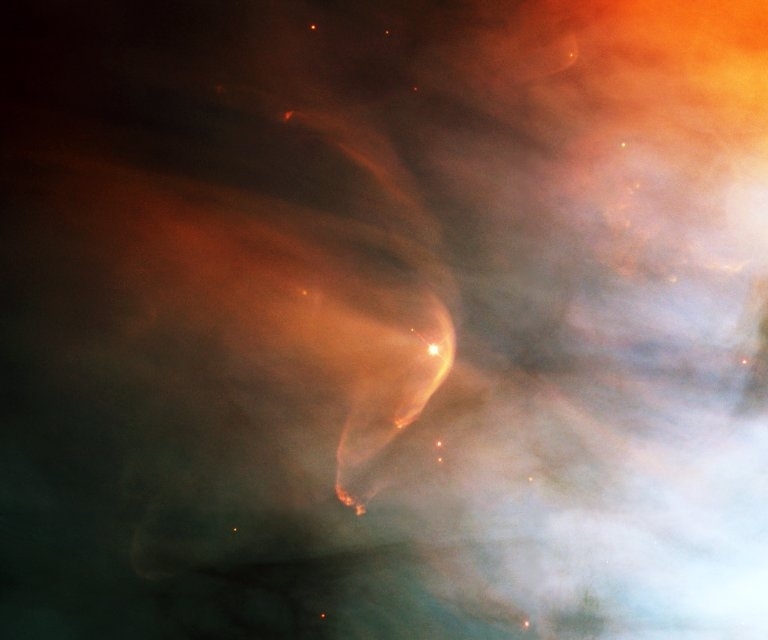 Bow shocks in the Orion Nebula. The large bow shocks in the center and the smaller one above it form in front of invisible astrospheres surrounding two bright stars. Image credit: NASA/STScl/AURA. Voyager’s primary mission was to study the giant outer planets. It began in 1965 when the Jet Propulsion Laboratory was looking for times when the outer planets were aligned so that swinging by one could be used as a gravitational slingshot to speed a spacecraft onto the next. Although there are frequent opportunities for gravity assists involving two or three planets, once every 175 years Jupiter, Saturn, Uranus, and Neptune are aligned so that a spacecraft can swing by all four, picking up speed at each flyby. This Grand Tour trajectory reduced the flight time to Neptune from thirty years to only twelve. Fortunately, an opportunity for launching on a Grand Tour trajectory came in the late 1970’s. However, a twelve-year flight proved to be too bold a step, so rather than losing such an opportunity, an ambitious project named Mariner Jupiter- Saturn ’77 was planned for a four-year mission to Jupiter and Saturn as the first leg of the Grand Tour. With five years to develop and test the first autonomous planetary spacecraft, the renamed Voyager 1 and 2 were launched on slightly different trajectories that increased the likelihood of at least one successful encounter with Saturn and maintained the option for a step-by-step completion of the Grand Tour if both were successful. Voyager 1 led the way past Jupiter, which gave it a big enough boost to reach Saturn, with its rings and the moon Titan as primary scientific objectives. They lie in Saturn’s equatorial plane, which is inclined to the plane of the planets. So, for an optimal study of Titan and the rings, the Voyager 1 flyby trajectory was also inclined, sending the spacecraft northward out of the planetary plane with no further planetary encounters possible. 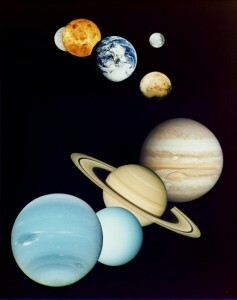 The planets. The rocky terrestrial planets, Mercury, Venus, Earth, and Mars, are at the top with the Moon. The lower four are the giant outer planets, Jupiter, Saturn, Uranus, and Neptune (not to scale). Image credit: NASA/JPL. With the success of Voyager 1, Voyager 2 remained in the planetary plane during its Saturn flyby, continuing on to Uranus and Neptune. A flyby over Neptune’s north pole deflected Voyager 2 southward for a close flyby of the moon Triton. As a result, Voyager 2 is heading southward and Voyager 1 northward as they leave the Solar System. The Voyagers discovered unexpected diversity. Unlike the rocky inner planets – Mercury, Venus, Earth, and Mars – the outer planets are giant bodies of gas and liquid with no solid surfaces. Deep inside Jupiter and Saturn, hot, rocky cores lie buried under a deep layer of mainly hydrogen and helium, with ammonia ice crystals forming visible clouds in their atmospheres. 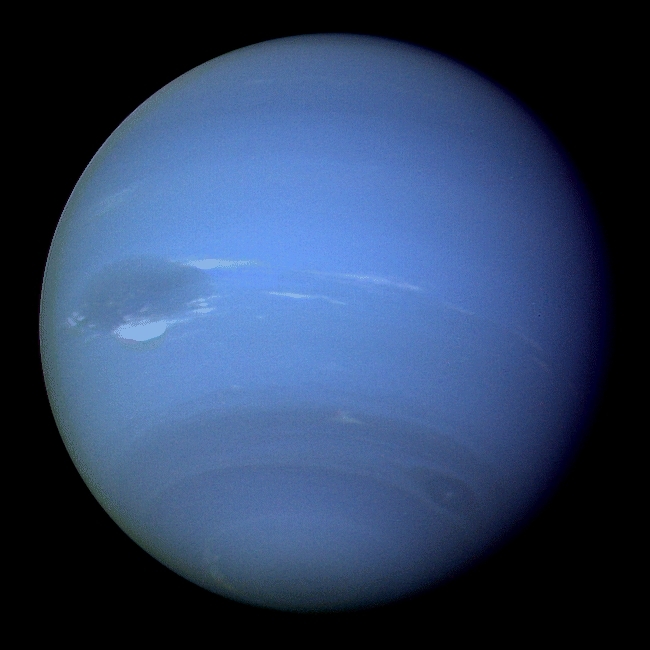 Uranus and Neptune have similar cores but are smaller because there is much less hydrogen and helium in their outer envelopes. Clouds of methane ice form at the top of their very cold atmospheres. There are dozens of moons orbiting the giant planets, several the size of the planet Mercury, but most much smaller than Earth’s Moon. Because it is so cold, some moons are half water ice and half rock. Even so, Voyager found each was distinctive, with icy surfaces often showing evidence of past geological activity. Voyager observed distinctly different ring systems about the four planets. The broad icy rings of Saturn were rippled with waves caused by the gravity of nearby moons, and two moons were found to shepherd finer ring material into a narrow ring between them. Both Uranus and Neptune have multiple narrow, dark rings, while Jupiter’s faint broader rings are formed of dust from nearby moons. Even the magnetic fields of the giant planets were surprising. Jupiter’s magnetic field is the largest structure in the Solar System, inflated by the pressure of oxygen and sulfur escaping the surface of the moon Io. Equally unexpected was the orientation of the magnetic fields of Uranus and Neptune, with their magnetic poles nearer their equators than their rotational poles as on Earth and the other planets. There were many such unexpected discoveries at each planet. Jupiter’s Great Red Spot, a giant counterclockwise rotating storm system nearly three Earth diameters across, is the largest of dozens of storm systems continuously forming and merging in the turbulent atmosphere. Clouds of ammonia ice crystals mark bands of jet streams circling the globe at speeds of more than 300 kilometers per hour. Jupiter, Io and Europa. Jupiter’s Great Red Spot is a storm system nearly three times the diameter of Earth. There are orange deposits on volcanically active Io and a white icy crust on Europa. Image credit: NASA/JPL. Four large moons orbit Jupiter, each with distinctive characteristics. The outer two, Ganymede and Callisto, are half water ice and as large as the planet Mercury. Impact craters scar the ancient icy surface of Callisto, while faults and grooves from past geological activity mark much of Ganymede’s surface. In contrast, Io and Europa, the inner two large moons, are mainly rocky objects the size of Earth’s Moon. Io was the site of the astonishing discovery that set the stage for the mission’s subsequent revelations. There were eight active volcanoes, with plumes rising up to 300 kilometers above a surface pocked by hot, dark lava-filled volcanic craters. 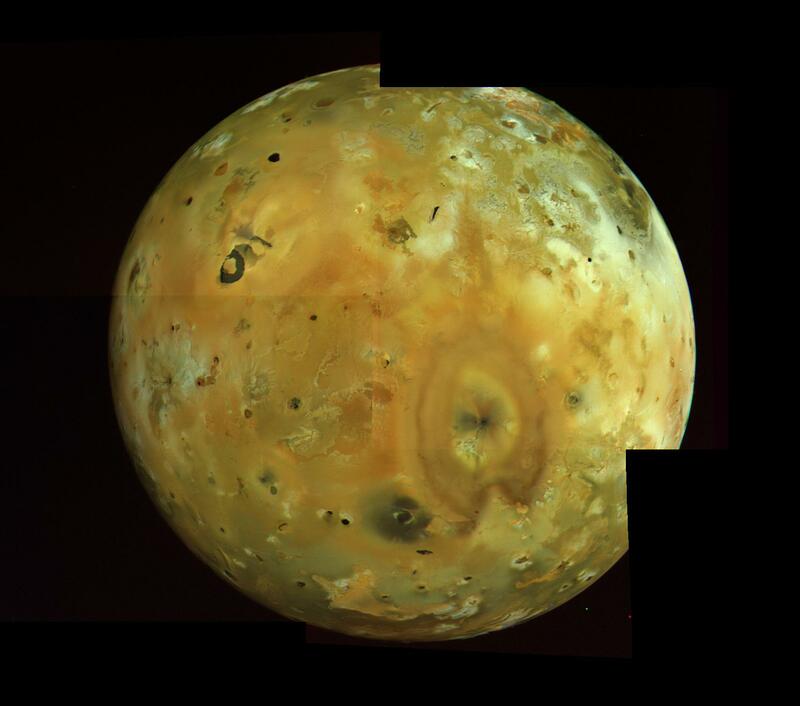 Driven by the tidal flexing of its crust as it orbits Jupiter, Io has one hundred times the volcanic activity of Earth. It sheds a ton of sulfur and oxygen ions per second that forms a doughnut-shaped torus around Jupiter, inflating Jupiter’s giant magnetic field to twice the size it would otherwise be. Jupiter's moon Io. The large heart-shaped pattern is the deposit of a volcanic plume erupting at its center. The many black features are volcanic calderas. Image credit: NASA/JPL. Like Io, neighboring Europa is a rocky object, but is covered with water ice. 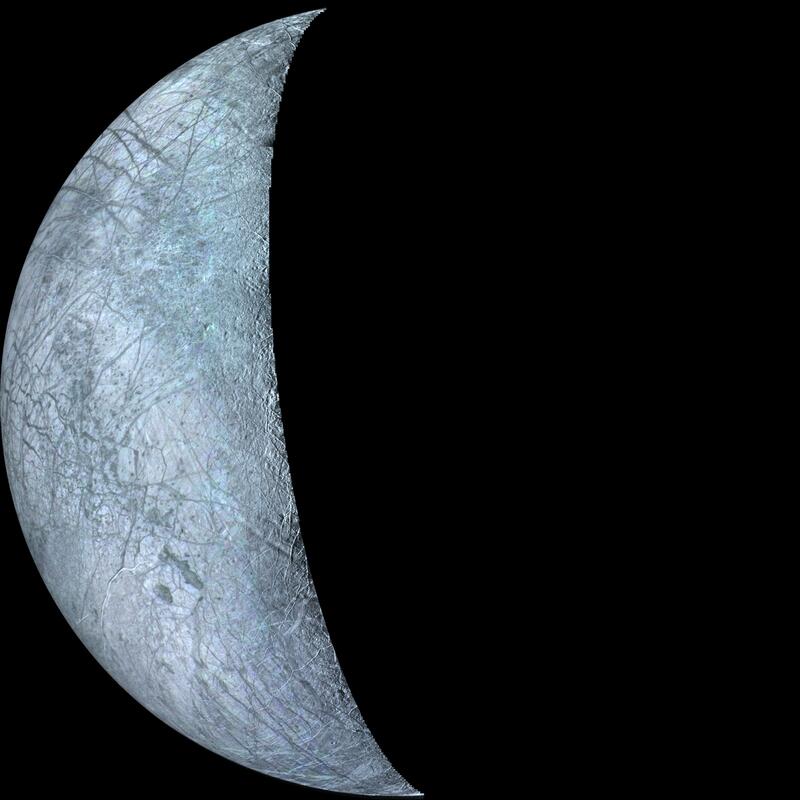 Europa’s surface, the smoothest in the solar system, resembles a floating ice pack, with faint streaks marking where tidal flexing has cracked the surface. Although Europa is further from Jupiter and the tidal effects are weaker than on Io, there is likely enough tidal heating to create an ocean of melted ice beneath the frozen crust. Evidence of such an ocean was found by the Galileo spacecraft in its close flybys of Europa during its mission in orbit about Jupiter in the late 1990’s. Jupiter's moon Europa. The icy crust is the smoothest surface in the Solar System, with streaks formed by tidally induced cracks in an icy crust likely floating on an ocean. Image credit: NASA/JPL/USGS. Saturn is colder than Jupiter and the atmosphere is less turbulent and hazier. Unexpectedly, winds race at up to 1800 kilometers per hour, more than five times faster than in Jupiter’s atmosphere. 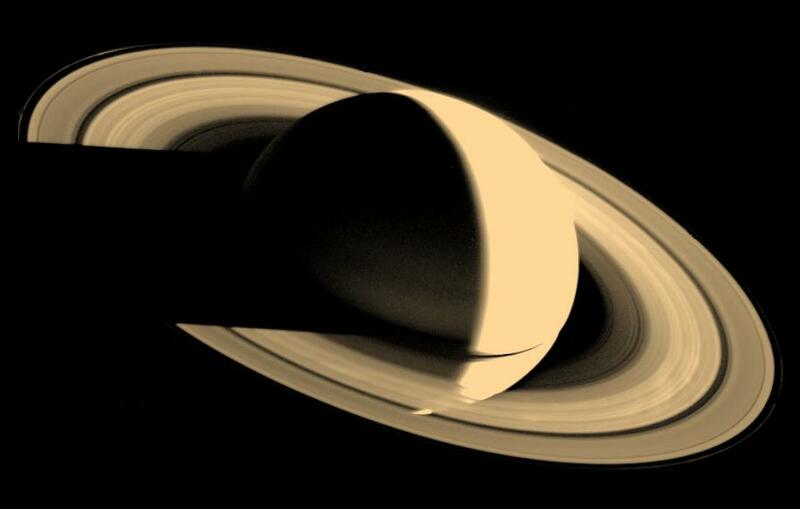 Saturn and its rings viewed from above and behind Saturn. The outermost A-ring, the brighter B-ring, and the fainter inner C-ring are composed of countless icy fragments with ripples and gaps due to moons orbiting nearby. Image credit: NASA/JPL. Saturn’s rings make it the most beautiful of planets. These swaths of countless small icy fragments orbiting the planet also held surprises. Rippled by waves generated by the gravity of small nearby moons, the broad rings resemble an old phonograph record. At the outer edge of the broad rings, two small moons shepherded debris between themselves, creating a narrow, multi-stranded ring kinked by the gravitational effect of the moons. The shepherd moons and many other small moons appear to be irregularly shaped fragments of larger moons shattered by comet impacts. Such collisions left craters on the larger moons, some with diameters one-third that of the moon itself. Any larger impact would likely have shattered those moons as well. 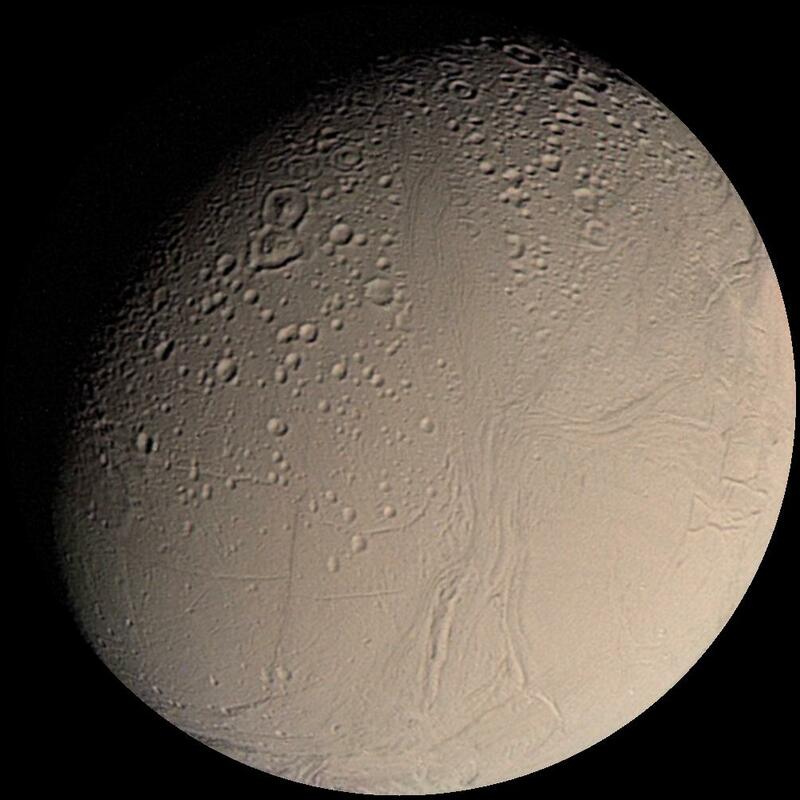 Enceladus, an icy moon only 500 km across, boasts a snowy white surface that is the brightest in the Solar System. Geyser-like plumes, as discovered by the orbiting Cassini spacecraft launched in 1997, erupt from fractures in the south polar region and deposit fresh ice on the surface, some escaping to form the faint E-ring. Reflecting nearly all of the incident sunlight, the average surface temperature is only 75 degrees above absolute zero. Some of the surface is ancient and heavily cratered as expected, but on such a small cold body it was surprising to find tectonic features such as grooved terrain and long rift valleys. Other younger areas are smooth, having few impact craters. Saturn's moon Enceladus. The grooves, faults, and smooth regions are the result of extensive, continuing geological activity. Image credit: NASA/JPL. Saturn’s largest moon Titan is slightly larger than the planet Mercury. Titan has a substantial nitrogen atmosphere as on Earth, but with a surface pressure one and a half times greater. There is no oxygen, which on Earth was originally produced by microbes. Instead, there is methane, or natural gas. Irradiation produces organic compounds that rain onto the surface. More complex molecules form opaque haze layers that optically obscure Titan’s surface. Due to the opaque haze, Voyager could not image Titan’s surface, but in 2005 the Huygens probe carried by Cassini parachuted down to Titan’s surface, revealing stream-like drainage systems and flat, dry lake beds. Subsequently, Cassini’s imaging radar peered through the haze layer, finding large lakes, likely formed from methane and other hydrocarbons that rain onto Titan’s surface. The complex organic chemistry in Titan’s atmosphere may resemble that which occurred in the Earth’s early atmosphere before microbial life evolved. Future missions will study the chemistry of Titan’s atmosphere, the water beneath Europa’s icy crust, and the geysers erupting from Enceladus. They may tell us about the conditions necessary for the origin of life. Uranus is tipped on its side, so its seasons differ from the other planets. At the time of the Voyager 2 encounter, Uranus’ south pole was facing the Sun. Nearly twice as far from the Sun as Saturn and lacking a significant internal heat source, Uranus has the coldest planetary atmosphere in the Solar System and much less energy to drive atmospheric activity. Even so, a few faint cloud features revealed wind speeds of nearly 900 kilometers per hour at mid-latitudes. 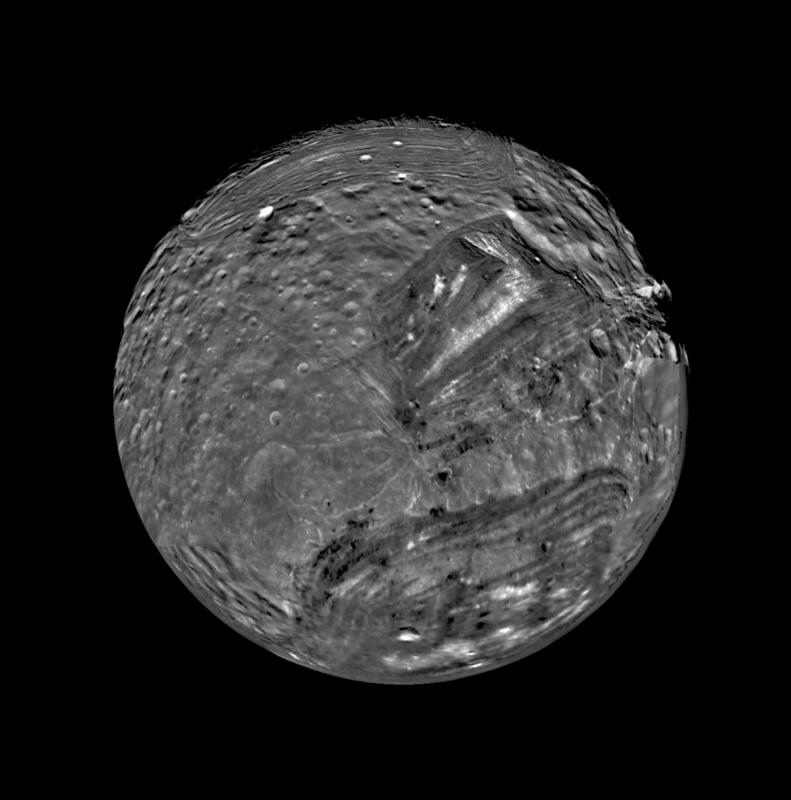 Uranus' moon Miranda. Extensive geological activity in the past has created a complex surface on this tiny moon with a diameter of less the 500 kilometers. Image credit: NASA/JPL..
All smaller than Earth’s Moon, five icy moons orbiting Uranus were expected to have cooled off and frozen quickly after forming. Unexpectedly, faults and other indications of past geological activity were found on the surfaces of several. Miranda, the innermost, is less than 500 kilometers across, yet has one of the most complex geological surfaces that Voyager observed. Heavily cratered older regions surround patterns of parallel ridges and grooves, some 20 kilometers deep, indicating that the surface of even such a small body was reshaped by an era of intense geological activity likely caused by tidal heating. Neptune is thirty times as far from the sun as the Earth, so there is only one nine hundredth as much solar energy to drive its weather. Surprisingly, winds of 2100 kilometers per hour are the fastest in the Solar System, and there was a Dark Spot that resembled Jupiter’s Greater Red Spot. However, a few years later the Hubble Space Telescope found that the Dark Spot had disappeared and other spots have since appeared. Neptune. The Great Dark Spot is a large storm that has now disappeared. Clouds of methane ice revealed the fastest winds in the Solar System. Image credit: NASA/JPL. Triton, an icy Pluto-like body from the Kuiper Belt, was captured by Neptune and orbits in the opposite direction to the planet’s rotation. 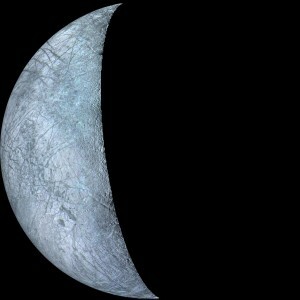 Initially, Triton was in an elliptical orbit, causing tidal flexing of its surface that heated and melted its interior. This produced a uniquely textured surface resembling a cantaloupe, along with ridges and valleys and smoother regions produced by icy flows. As a result, the surface is among the youngest in the Solar System with most impact craters erased by the icy volcanism. 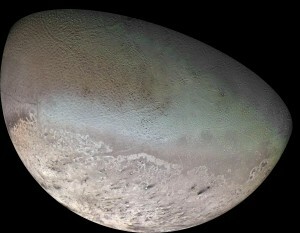 Neptune's moon Triton. The coldest body Voyager 2 observed has a polar cap of frozen nitrogen marked by dark streaks of dust deposited by plumes of geysers erupting from its surface. Image credit: NASA/JPL. With its icy surface reflecting much of the solar heat, Triton is the coldest object Voyager encountered. With a surface temperature only 38 degrees above absolute zero, most of the nitrogen freezes, forming a nitrogen ice polar cap. Surprisingly, even at this low temperature, geyser-like plumes erupt eight kilometers upward into a thin atmosphere, depositing dark streaks of dust on Triton’s surface. Our knowledge of the local interstellar medium is very limited. Therefore, the size and shape of the heliosphere were unknown. When the Voyager spacecraft finally crossed termination shock and began exploring the heliosheath, they revealed unexpected complexity . Voyager 1 is headed northward from the solar equator. In December 2004, it crossed the termination shock at 94 astronomical units (14 billion kilometers; an astronomical unit (AU) is the distance from Earth to the Sun). 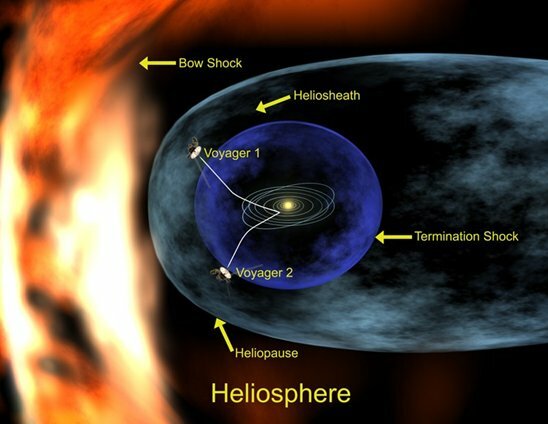 As Voyager 1 moved deeper into the heliosheath over the next three years, the solar wind pressure began decreasing, causing the heliosphere to shrink and the shock to move inward to 91 AU in the northern hemisphere. Voyager 2 is headed southward, and in August 2007 it found the shock at 84 AU, 1 billion kilometers closer to the Sun. So, the termination shock is pushed closer to the Sun in the southern than in the northern hemisphere, as could be caused by an interstellar magnetic field tilted so as to press inward more strongly in the south . As it crossed the shock, the solar wind plasma lost 75% of its kinetic energy as the speed dropped from 1 million kilometers per hour to half that speed in the heliosheath. It was predicted that the missing kinetic energy would heat the slow solar wind in the heliosheath to 1 million degrees celsius. However, the temperature reached only 100,000 degrees, indicating that most of the energy lost by the solar wind didn’t heat the wind itself, but heated interstellar ions that had entered the heliosphere as neutral interstellar atoms and were subsequently ionized. It was predicted that some of the interstellar ions would bounce back and forth like cosmic ping pong balls between the magnetic fields on opposite sides of the shock, becoming low energy cosmic rays as they slowly gained speeds up to half the speed of light. As a result, it was expected that the intensity of these cosmic rays would be highest at the shock. However, neither Voyager found an intensity maximum at the shock. Instead, the intensity is higher further out in the heliosheath away from the shock, indicating that the source of these low energy cosmic rays is not the shock regions crossed by the two spacecraft. Future observations may reveal whether anomalous cosmic rays originate at remote regions of the shock or in the outer regions of the heliosheath. As the two Voyagers continued to explore the heliosheath the Interstellar Boundary Explorer (IBEX) launched in 2008 will make a two-dimensional map of the heliosheath as viewed from Earth orbit. Measuring the intensity of neutral atoms streaming toward Earth from the heliosheath, IBEX will provide a new estimate of the distance across the heliosheath to the edge of interstellar space. Voyager 1, at present, is at about 115 AU (about 10 billion miles or 16 billion kilometers) away from Earth. Observations from Voyager 1 indicate that the solar wind speed has slowed to zero suggesting that it has turned sideways by the interstellar pressure. The first observations were obtained in June 2010 and confirmed a few months later in December. This is a major milestone for Voyager 1 indicating that it is nearing the edge of the solar system, the heliopause, and will be leaving the solar system in the near future. It is expected that Voyager 1 may cross the heliosheath and enter interstellar space by 2015. Surrounded for the first time by matter from other stars, it will measure the direction and strength of the local interstellar magnetic field draped around the heliosphere and the intensity of low energy cosmic rays from the galaxy that are blocked from entering the heliosphere. If the spacecraft remains healthy, there is enough electrical power from its radioisotope thermoelectric generators to last well beyond 2020 when Voyager 1 will be more than 150 AU from the Sun. The International Geophysical Year ushered us in the Space Age. The subsequent era of space science has given us a new view of the Solar System, revealing dozens of unexpectedly diverse worlds enveloped in a giant heliospheric bubble created by the Sun. It has also given us our first journey to interstellar space, setting the stage for even more distant journeys. Most importantly, it has given us the knowledge that there is much more to be discovered and the impetus to launch future journeys of exploration as well.